A discussion group in LinkedIn had a post today about “GO” being the first thing that someone should do as a new manager. DO SOMETHING seemed to be the main thrust. Sometimes, “go” gets us going in the wrong direction or it comes across wrong to others in the workplace. GO probably feels good to do, but it is not going to help anyone build a team and generate alignment to shared goals and involve and engage others. 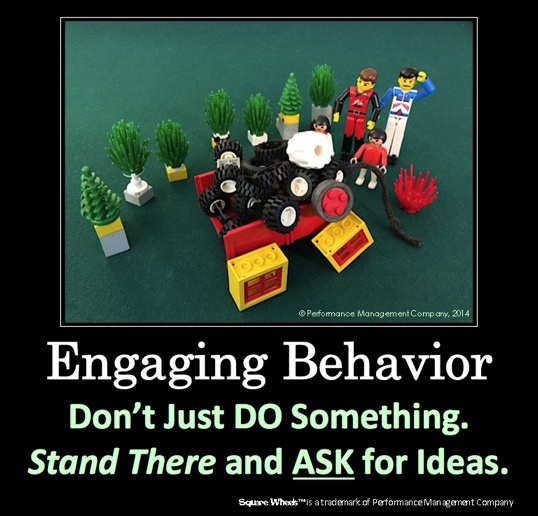 Sure, YOU will feel involved and engaged, but they only you will have ownership engagement. Take a moment to insure that you have the right perspective on things. And then ASK those others for their ideas and suggestions and do the simple things to get them to start to be more and more involved and engaged. There would be little lost by spending some time at the start in gathering ideas and starting involvement. But then I thought about it a bit more and came up with this as a way of illustrating my thinking about Asking, Involving, Engaging and Implementing, knowing that a sense of teamwork and ownership is a key to moving things forward more better faster. Have FUN out there is important, too! ← Don’t Think about Innovation. Don’t think about Elephants.